For those not familiar, ‘Zindagi Na Milegi Dobara’ (loosely translated to ‘you won’t get this life again’) is an Indian blockbuster film about 3 childhood friends who embark on a road trip across Spain to celebrate a bachelor party. Instead they discover themselves along the journey and forge even thicker bonds. Unfortunately (or fortunately), being a millennial means squandering a sizable portion of your income on insta-worthy travel and discovering upcoming adventures via pop-culture or whimsical travel-bloggers. And, life is too short to fantasize about “someday”. After all, isn’t instant gratification the mantra our generation swears by? Streets in Ronda open up to the possibilities of endless blue skies. But before you make any conclusions about my lack of originality, let me assure you that Spain was picked quite out of the blue. Spain is midway (almost) for the couple in an inter-continental relationship at the moment. Patagonia-free weather in September compared to rest of Europe. Return flights decently priced. Lastly, after numerous road-trips across North America, Europe just seemed like the perfect next few miles to burn destination. Can you feel & smell the approaching South Spain Mediterranean? Lush vineyards, tomato farms, dramatic rolling hills, pristine blue skies, and fragrant olive gardens welcome you all along. An American driving license works just fine and all top rental car companies accept pre-booking and unlike in the US, picking up/dropping off rentals in different cities costs almost the same. So you can easily mix-it up taking the train back one-way. Pro-tip: Feel free to generously use google translate every chance you get! Road signs, conversations with airbnb hosts, to read menu cards and place orders to. A life savior! So let me take you along our road trip across Spain! Instead of a city-by city itinerary, i want to share 7 things you should experience to really soak in the magical & mesmerizing Spain. Every great architect – is necessarily – a great poet. He must be a great original interpreter of his time, his day, his age. The architecture of any place narrates a vibrant story of the inhabitants, the visitors, the conquerers, those defeated, and those that prevailed in the end. 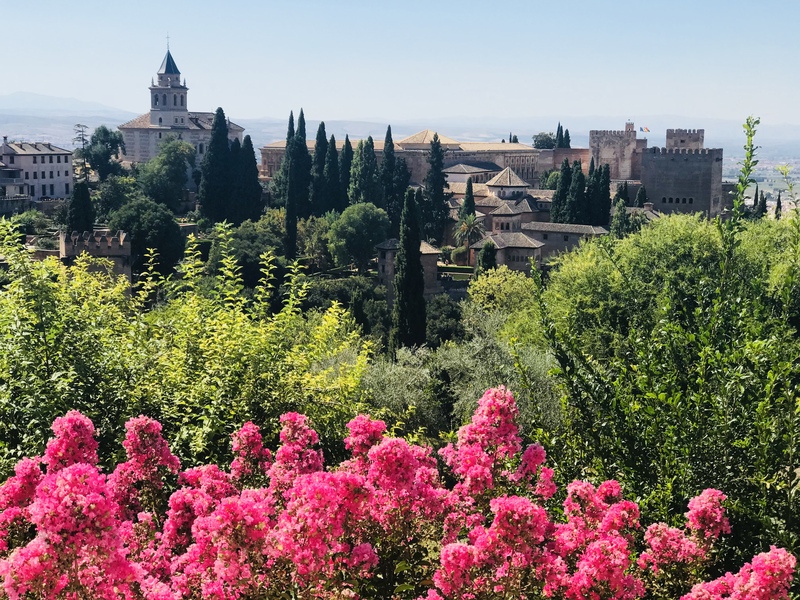 Walking through the cities, towns and villages of Spain is like flipping through the pages of a history book of wars, conquests, treaties, and cultures that sustained the test of time. Spanish architecture draws from a host of influences including Iberian, Roman, Gothic, Islamic, and of course the greatest Catalan modernist architect, Antoni Gaudi. The charming city of Seville offers magnificent palaces, churches and bustling plazas where locals come together to eat, pray and love. The moorish town of Ronda takes you back to simpler times. Bridges built on deep gorges, spectacular sunsets and moon-rises adorn the quiet found only in quaint town streets. Puente Nuevo bridges the gorge town that is Ronda. Make sure to catch all perspectives across different times of the day of this marvelous piece of engineering. The amalgamation of Islamic and Roman architecture is most evident at the palace fortress of Alhambra in Granada. While its symmetrical arches, meditative motifs & royal gardens speak of the illustrious Islamic reign, renaissance style fountains, and cathedrals announce the arrival of the Christian reconquests. Fun fact: Alhambra is also where Christopher Columbus received royal endorsements for his expeditions across the Atlantic ocean. Alhambra, a UNESCO world heritage sight that showcases fortification and defense tactics ahead of its time. Spain has 47, the third largest UNESCO world heritage sites after Italy and China. The royal palace of Madrid reminds the world of the magnitude of Spanish colonial power and the great conquests. Standing among the intricate carvings, the gold inlay, the extravagant parlors, the exquisite gardens, the expansive courtyards, you cant help but think about the countless faceless indigenous cultures and peoples’ backs on which this history was built. We often glorify the civilized world without due thought to all those whose history was wiped clean as a result. As in the case of its architecture, Spain builds its identity from multiple cultures and offers a diverse set of leisure activities. Be it an impromptu street performance of flamenco, a gory bull fight, or street walls adorned with graffiti, you will always find something new to revel in. Ceramic tiled crafts, locked up wishes, street art and Flamenco pull you in. I am too chicken to stomach matadors being mauled by raging bulls, but for some its a legit sport. The Bull-ring in Valencia where you can catch traditional bull fights between the season in March and October. Food is everything we are. It’s an extension of nationalistic feeling, ethnic feeling, your personal history, your province, your region, your tribe, your grandma. One of the most exciting parts about travel is being able to literally taste the essence of a place via its local foods. Nothing i write here will enable you to experience the food we ate and the the kilos we put on. So i urge you to travel! The most popular Spanish cuisine include small plates of Tapas and Paella (a staple Spanish saffron infused rice dish cooked in veg/seafood/poultry/meat). One meal too many. Paella, tapas, pizza, fondue, octopus, dessert, tacos, croquettes, patatas bravas and much more. Jamon iberico, chorizo, cured port tenderloin, botifarra, fuet, blood sausage. I don’t even eat red-meat and i couldn’t help but try all of it. While on vacation in Spain, sip on drinks both hot and chilled. In reality, Spanish siestas last all day long. Eat at local public markets in Madrid. An experience and flavors you will cherish forever. Too much dessert for a lifetime. Life is too short, eat dessert first. 4. Live among the locals. Ultimately, the power of Airbnb is that it motivates guests to blend into communities, belong anywhere and live like locals. Across my travels, i have written about how i have almost always chosen to live in real homes with the locals via Airbnbs. Watching them go about their morning jobs, cook authentic meals, and open up their most personal spaces to complete strangers across the world is a true testament to what humanity (and frankly internet technology) is made of. …or the modern comforts of a stylish pent-house in Valencia… you will find something that fits your mood & pocket. PS: Not at all affiliated with Airbnb in any manner. Just a very loyal user and proponent of the platform! There is possibly no better way to assimilate and experience daily life in a new place than on foot. Lose yourself in the narrow yet inviting lanes of Barcelona, Madrid, Valencia, Ronda, Seville, Grenada. All Spanish cities’ mysterious side lanes, hanging balconies and royal blue skies will promise a meditative time. Made more magical by your loved ones next to you. Spend ample time in the town-squares. Watch people go about their daily chores. Sit endlessly by parks, fountains, churches, and street performers. Valencia and its many sights, sounds, and bubble-makers. Walk into local stores. Admire street art. Watch dogs basking in the sun. The above Antoni Gaudi quote, best sums up the Catalan modernist’s quest to pay homage to nature. According to Gaudi, anything created by human beings is already in the book of nature. Privately funded for nearly 140 years, Basilica de La Sagrada Familia, the church of the holy family, stands testament to what faith and dedication can make possible. Approaching it is really like nothing else you have experience. The sheer magnitude is nothing but profound. Slated to complete construction in 2026 or 2028, some cynics believe that the longer this piece of architecture is under evolution the more attraction it draws. I beg to differ. Nativity and the Passion Tower are an ode to nature itself. Everywhere you look, you will find a story about time passing by. Just the act of entering the basilica, standing still and looking up at the ceiling makes you feel small. Almost insignificant. More than a century of architectural effort, countless prayers, and incredible amount of faith strengthens the very being. Much like nature, in its continuous state of evolution lies most of its beauty. Look up, and you will sense pure poetry in geometry. Spectacular light play by glorious sunrises and sunsets, diffused through gigantic stained glass windows ensure a new awakening in the power of nature or a superior force; even among the most unbelieving. It is as though, the celestials bodies and light itself want to mesmerize you with their magic. 7. Nature. Soak it in. No matter where you go on earth, the beauty of nature will envelop you in her arms and let you know that you are but a small part of the interconnected life on this beautiful planet we call home. … or the mighty ocean itself… in its similarity across countries is the lesson that we are all the same too. Make sure to soak in the eternal nature on any trip. There is no better way to recharge your batteries from all the travel, than by enjoying the peace and calm that nature has to offer. Get bronzed and soak in some happy Spanish sun! Learning about a new place doesn’t involve collecting things from and showcasing them back home, but requires you to approach travel with an open mind, big heart, and sense in everything you can see, touch, smell, taste, and feel. In the end, no matter where you choose to go next, the moments that are worth experiencing stimulate your senses to the fullest. They feel authentic and often include imbibing the culture with honesty, learning about its history with inquisitiveness, indulging in food without guilt, staying with the locals without judgement, soaking in nature in plenty, and connecting with people deeply. And when you throw in a funky colored car, endless roads, and your loved one, it just makes for a lifetime worth of memories! Check out my previous blog on Death Valley National Park and the one coming up! You can also follow me on Instagram. Find exotic videos of everyday life in Spain on my Insta-Story/IG-TV highlights. Previous Death Valley National Park – Did i catch the Super Bloom? Next Biscayne National Park – Will you migrate with the birds? Wow Arch. Very nice. We always knew your were good. Keep it going. Haven’t seen on a post it for some time. Followed your blog. Good luck for your future endeavours. Words are powerful and yours took me on a journey of its own… Grt insight.. cheers to more ..
What an awesome trip you guys had…covered almost all of it. Pictures are stunning.